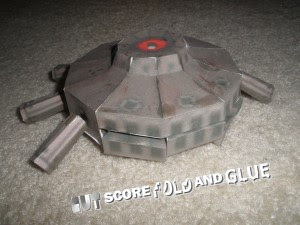 The mech gunner was used to defeat the Nazi zombies in the movie Sucker Punch. It was piloted by Amber (Jamie Chung). 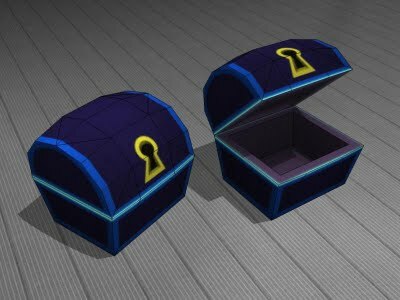 This treasure chest papercraft is from the Space Paranoids area of the Kingdom Hearts 2 game. Space Paranoids is a fictional video game created by the character Kevin Flynn in the 1982 movie Tron. 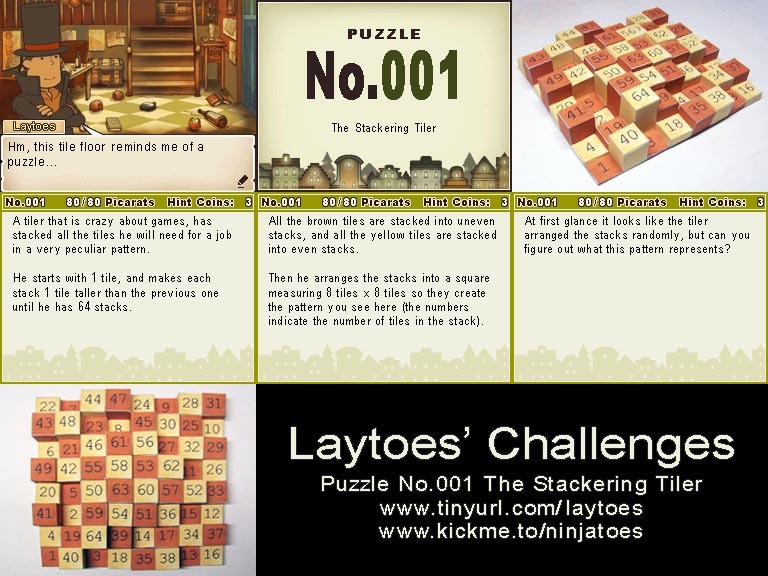 Inspired by the Professor Layton games, Ninjajoes has created his own puzzle papercraft. 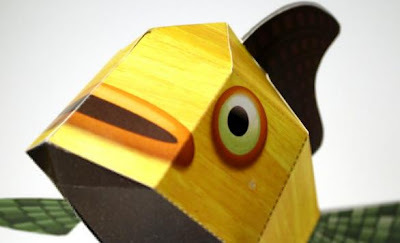 Ready your puzzle-solving skills. The Professor Layton games for the Nintendo DS are short, but fun. Wake up sleepy bunny or the real rabbit will eat your carrot! 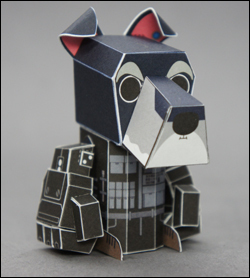 A cute papertoy from saltnpaper. 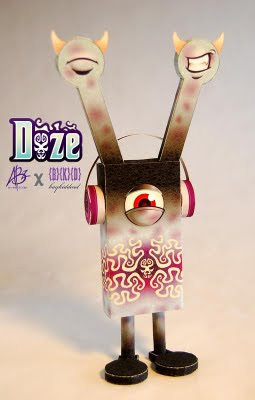 Abi of Oh-sheet has customized Baykiddead's Leechoso papertoy. "Doze aka The Sandman is lethal. One only needs to observe the patterning on his skin to know this. He worked as a freelance 'cleaner'. His favorite movie is Kill Bill Vol. 1. Whispering 'wiggle your big toe' just before pulling the trigger became a ritual. In 2005, he retired from the syndicate to pursue his true passion, music. He now sings lead and backup vocals for his hugely successful rock band, Kiddo's Black Mamba." 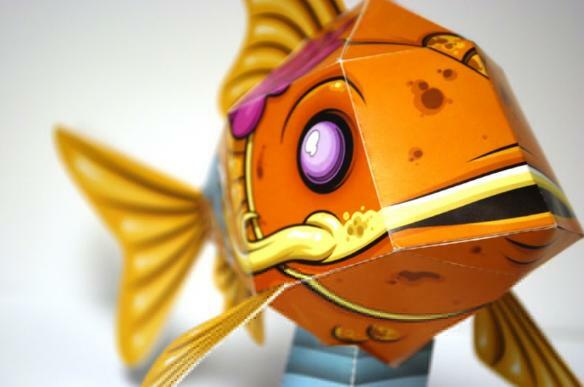 Angler Fish is the mini-boss in Jabu-Jabu's Belly in the Legend of Zelda Oracle of Ages. 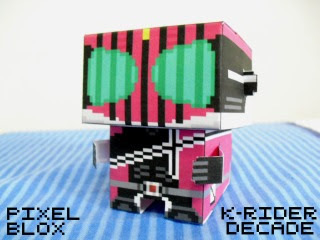 Scarfy is an enemy character that appears in several games in the Kirby series. Although it looks cute and harmless, if Kirby tries to inhale Scarfy, it turns into a beige-colored, one-eyed creature that will chase after Kirby and explode on contact. 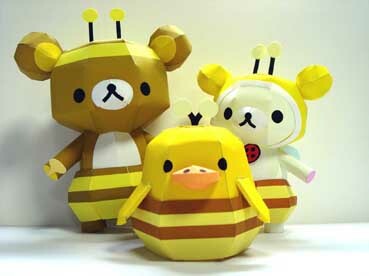 The Relax bear gang is out to get some honey. They're dressed in bee costume so the bees won't sting them..lol. 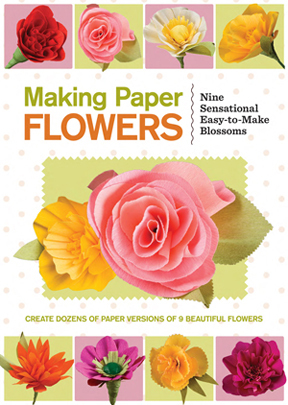 And the lucky winner in our Making Paper Flowers Contest is Jamie Austin from the Unites States! Congratulations!!! I'll send you an email to get your details. There were readers from other countries who joined but did not qualify as the sponsor can only send the kit to the US and Canada. Watch out for more contests in the future! 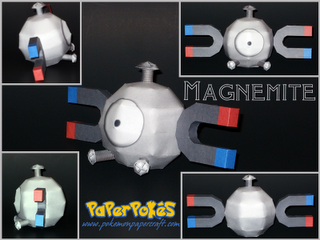 Magnemite is a dual-type electric/steel Pokémon that evolves into Magneton which then evolves into its final form Magnezone. 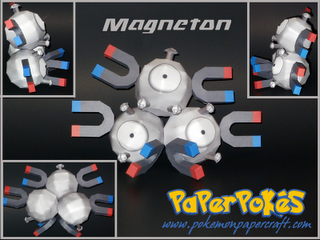 Magnezone is a dual-type electric/steel Pokémon that evolves from Magneton. 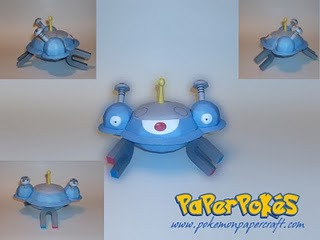 It is the final form of Magnemite. 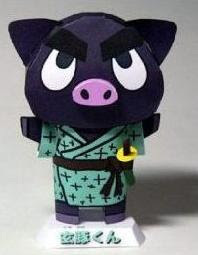 This black pig is the mascot for the 21th National Conference Kagoshima Industrial Education Fair. The Shield Liger is a lion-type Zoid from the Zoids universe. 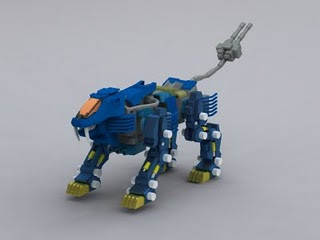 The Shield Liger plays a central role in Zoids: Chaotic Century. Graphic designer Mau Russo gives tribute to the Cosmonaut Yuri Gagarin with his latest papertoy. 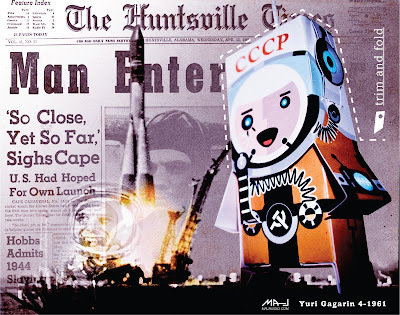 Yuri was the first man in space. 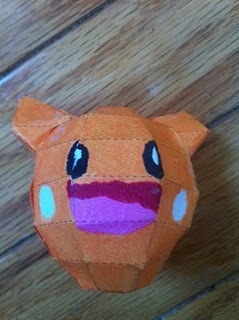 This really cute fire flower from the Super Smash Bros. Melee will give one the ability to shoot fire. 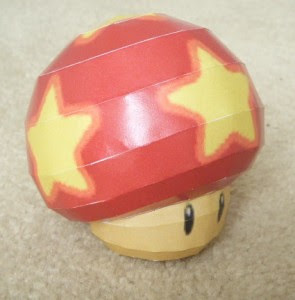 This life mushroom will give Mario or Luigi three extra lives in the Super Mario Galaxy game. 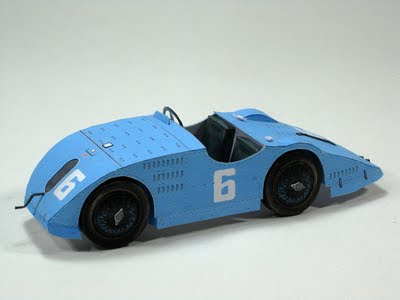 The Bugatti Type 32 was a streamlined racing car built in 1923. It has a tank-like body hence it was commonly called the Tank de Tours. 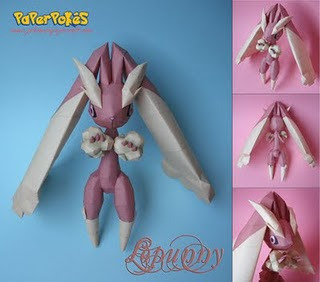 Lopunny is a normal-type Pokémon that evolves from Buneary. 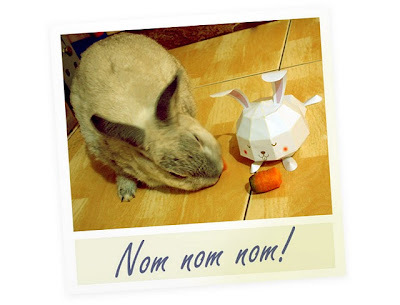 Lopunny stands on its 2 feet and are based on real-life rabbits. 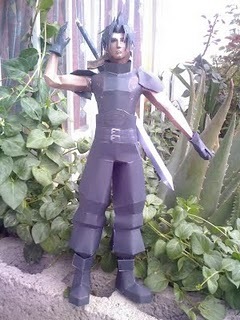 Zack is the main protagonist of PSP's Crisis Core: Final Fantasy VII, a prequel to Final Fantasy VII. As a SOLDIER, Zack is trained by his close friend, SOLDIER Angeal Helwey, in hopes of becoming a hero while working for Shinra. 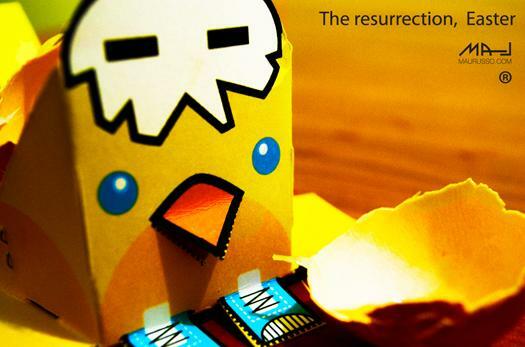 Happy Easter guys! It's time for another contest. 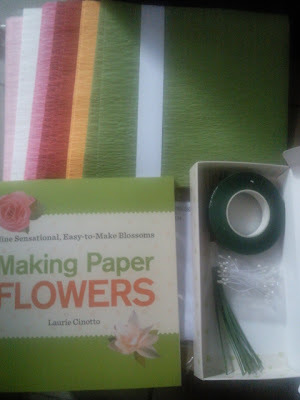 We are giving away a copy o Laurie Cinotto's Making Paper Flowers kit to one lucky winner. Again, the contest will be simple. Just post your name, country and email as a comment to this post. Only those with US or Canada address are eligible to join. If you live anywhere else then you can use the name and address of a friend or relative from those countries. I'll draw the winner either on Monday or Tuesday. 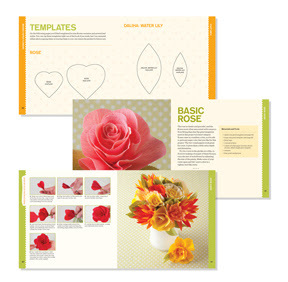 Big thanks to Will and Andrea of Sterling Publishing for making this contest possible. 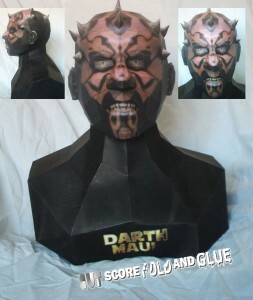 The guys from csfgpapercraft did a nice job with this Darth Maul bust. Darth Maul is the main antagonist of Star Wars Episode I: The Phantom Menace. 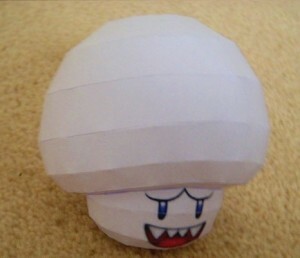 Touching these pale-white mushrooms can turn Mario/Luigi into a boo (ghost) in the Super Mario Galaxy game. MauRusso.com depicts Jesus Christ's resurrection with this cute Easter papercraft. This cute and colorful-looking Mecha Koopa is a fire-breathing enemy in the Super Mario Galaxy which can only be defeated by a ground pound. 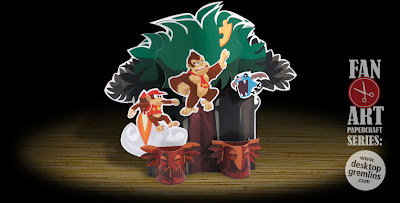 It seems that Donkey Kong Country Returns by Retro Studios for the Nintendo Wii console has been getting rave reviews. It sure looks like a fun game. 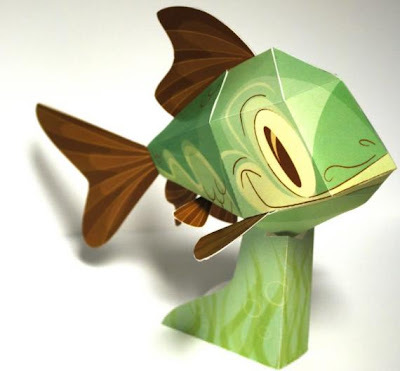 If you love it, then you'll love this papercraft from Dektop Gremlins even more. 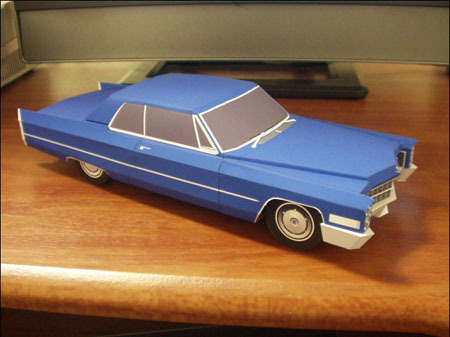 A penguin papercraft created for the 2011 South African Gashuku in May. 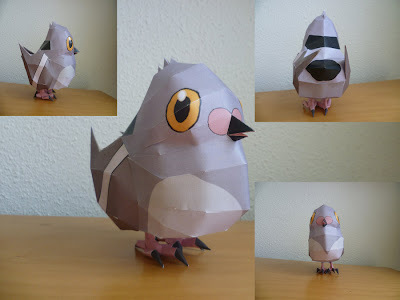 Pidove is a dual-type normal/flying Pokémon that evolves into Tranquill which then evolves into Unfezant. 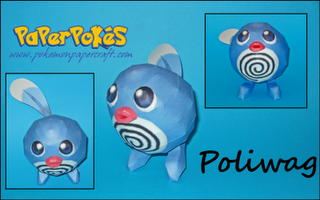 This dove-like Pokemon was introduced in Generation V.
Poliwag is a water-type Pokémon that evolves into Poliwhirl which then evolves into Poliwrath. 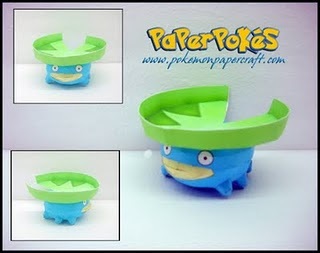 Lotad dual-type water/grass Pokémon that evolves into Lombre which then evolves into Ludicolo. The green thingy on his head appears like a lilypad. 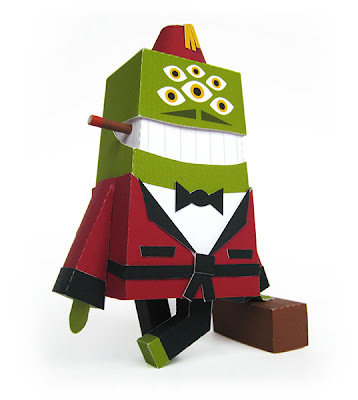 Swanky the alien bell boy is ready to assist you. This six-eyed papertoy is the latest from Marshall Alexander. Another reaver bot from the Megaman Legends. 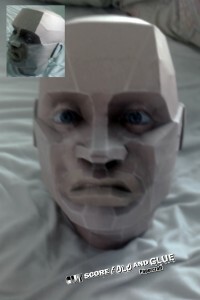 Kryten is head butler in the J.M. Barrie play The Admirable Crichtona in the British science fiction situation comedy Red Dwarf. 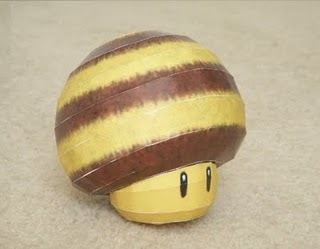 This cute-looking striped mushroom from the Super Mario Galaxy game can turn Mario into a bee. 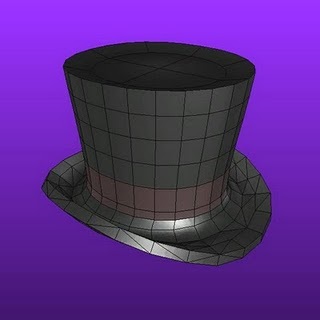 This top hat is one of the over 100 different hats from the Team Fortress series of video games. This particular hat is called the "Scotsman's Stove Pipe" by DeviantART member Fractaljinn. We got three more Koi designs from the C3 Cares. From the top are by Doug Kubert, Matt Hawkins and Tyler Coey. 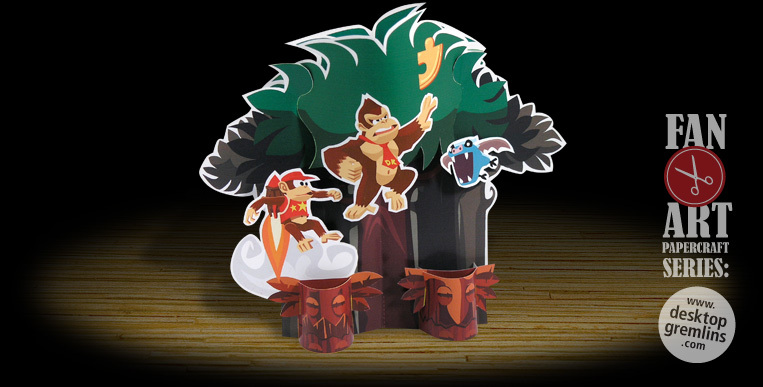 Be sure to visit the C3 Paper Koi site and donate $10 or more to the American Red Cross for Japan earthquake relief efforts! 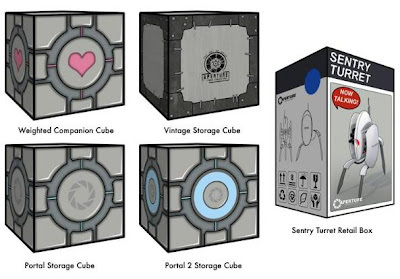 4 new Portal related Cubeecraft are available! Vintage Storage Cube, Portal 2 Storage Cube, Portal Storage Cube, and Sentry Turret Retail Box. You may not recognize her but she's Princess Zelda from the original NES game Legend of Zelda. 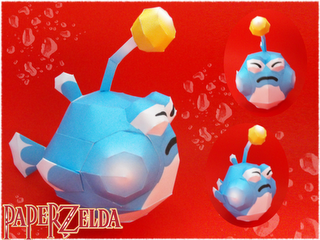 This 3D papercraft of the 8-bit Zelda is available in two different sizes, the 13 and the 15 cm versions. 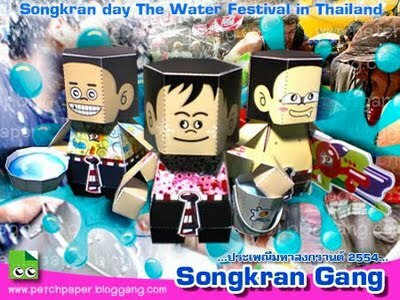 Songkram in Thailand is also known as the 'Water Festival' because people pour water at one another as part of the cleansing ritual to welcome the new year. 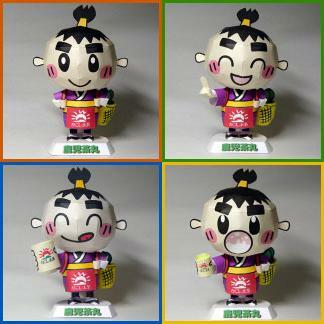 Check out these four cute versions of Kagocha, the mascot of Kagoshima Prefecture tea producers. 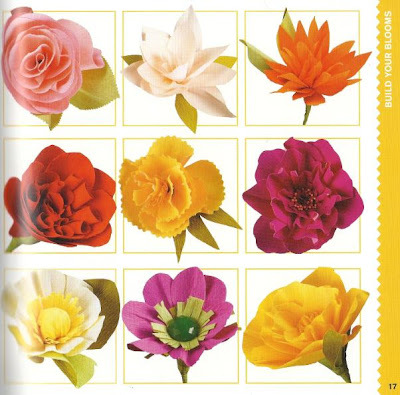 Flowers make a wonderful gift. You can give them in just about any occasion. But don't you think it's even better if you can make 'em yourself? Create bouquets of flowers from simple materials such as crepe paper, wire and floral tape. 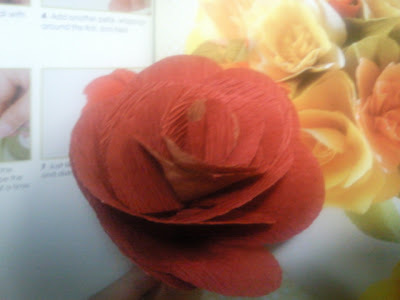 Once you have mastered the art of making flowers, the possibilities are endless. You can produce flowers in any color anytime you want. All that is possible with Laurie Cinotto's Making Paper Flowers Papercraft Kit. The illustrated book includes photo build instructions on how to make 9 different flowers: basic rose, dahlia: water lily style, dahlia: cactus style, dahlia: round style, frilly carnation, pretty peony, the eye-popping poppy, precious anemone and the springtime daffodil. The materials in the kit are enough to make 60 paper flowers. 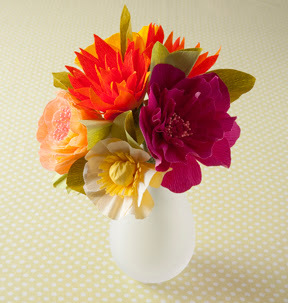 If you run out of materials, just go to your nearest craft supply store and continue making those beautiful flowers. The Making Paper Flowers kit by Laurie Cinotto retails for $14.95 and is in stores now. 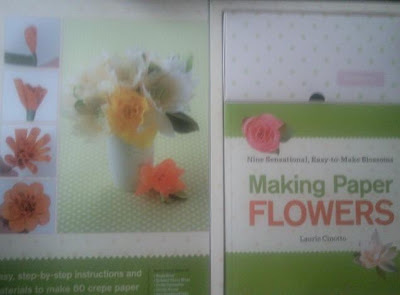 It is available at Barnes & Noble stores throughout the country and at www.barnesandnoble.com.